Saving the “how to adopt a dog” bit for last, Laidlaw has a no holds barred approach in conveying today’s world for dogs. Sure, he goes into the basics of what a dog needs (love, car, water, playtime, home), but he quickly changes gears to outline overpopulation issues, the plight street dogs face, puppy mills, chained dogs, exploited dogs (Iditarod, greyhound racing), and sadly, other realities. He lightens the subject matter through his eloquent writing style and by interjecting anecdotes from young Dog Champions who are working to better the lives of man’s best friend. 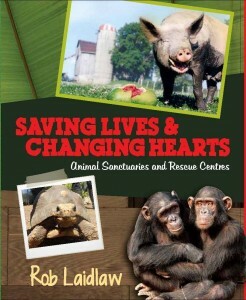 As a gal who has worked and volunteered for a number of sanctuaries, it was exciting to see this title in the mix. 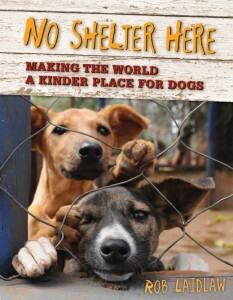 Here’s a great book to not only introduce the idea of what GOOD sanctuaries are like, why they’re needed, and the types of animals they take in and why, but how we can ascertain their operating principles and their meeting of the animals’ needs. Laidlaw gives a wonderful, global, and diverse overview of sanctuaries – from Animals Asia’s work with former bile farm bears to the American Tortoise Rescue in Malibu to Cedar Row Farmed Animal Sanctuary in Canada. He also dedicates a few pages to discussing faux sanctuaries, those that do a disservice to the animals in their care, and have thus inspired the creation of a sanctuary certification organization, the Global Federation of Animal Sanctuaries. Both are great introductory reads into the multifaceted world of animal protection, and I highly encourage every parent to get copies of Laidlaw’s titles for their child’s classroom. They’re a wonderful academic resource and a much needed form of humane education.